Mention the word ‘fort’ and the images that come to mind are all too common – elaborate histories; kings, queens, and palace intrigues; battle-worn warriors; huge stone ramparts with intricate carvings; crumbling walls of empty palaces; and large desolate spaces, peopled these days by a large number of tourists. All forts are about history, of accounts of the past and of stories of the dead. All forts, except one! In the far western corner of India is an exceptional fort that rises like a golden miracle from the flat, unforgiving sands of the Thar desert. Constructed atop the Trikuta Hill in Jaisalmer, it is the second oldest fort in Rajasthan and one of the largest in the world. Three layers of walls constitute this magnificent structure. The outer, or lower, layer is made of solid stone blocks that also help reinforce the rubble of the hill. The middle wall, or second layer, snakes around the fort. The third and innermost wall was the vantage from where Rajput warriors hurled boiling oil and water and massive round rocks at intruders. The fort also has 99 bastions, 92 of which were built between 1633 and 1647. What is perhaps most fascinating, however, is that for the better part of its 800-year history, the fort was the city of Jaisalmer and the city, the fort. 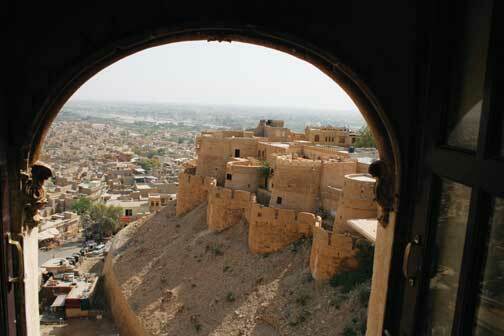 Like all forts, Jaisalmer has its own history – a fascinating blend of fact, myth, and legend. In 1156 A.D., Rawal Jaisal, a descendant of the Yadav clan and a Bhatti Rajput, is said to have abandoned his fort at Lodurva, about 18 kilometres away, and, on the advice of a local hermit, founded the new fort and capital of Jaisalmer. This article is based on the original article titled “Fort full of life” first published in Frontline magazine Volume 27 – Issue 09, April 24-May 07, 2010 and is being reproduced here with permission from the author.